Quick break from my Portugal posts, because my dear friend, X, is taking a long overdue trip to Italy this summer! She will be visiting family in Rome, but also wants to see some other parts of Italy while she's there, particularly Florence and Milan. We recently had dinner when I visited NY for work, and I was more than happy to offer to do some research on itineraries for her! You could also take this itinerary and add a couple days at the front or end in Rome and/or Venice, and have a pretty solid 10-12 day trip to Italy! X is flying in and out of Rome. She's going for a couple of weeks, and is planning on hanging out with family for a bit, and is also considering some side trips with them, so I kept her solo jaunt up to Florence and Milan to a 5 night trip. But - I also added in two optional days, to check out places I love and think are worth a visit! Start the day with a fast train to Milan from Rome. There are two types of trains that run in Italy - the high-speed ones and the regional ones. The regional trains from Rome to Milan can take upwards of nine hours, so I'd go with the high-speed train in this case. It looks like they depart almost every half hour throughout most days... so I'm recommending she take one that departs at 10:05am and arrives in Milan at 1:22pm, just in time for lunch and a casual afternoon! TRAVEL TIP: The Frecce train from Rome to Milan only takes about 3 hours. You must book a seat, which is actually helpful when you have any kind of luggage! Also, the TrenItalia website is really easy to use, and gives you both the fast and regional train times and prices. Stay close to the center, near the duomo (cathedral) and the Galleria. Hotels range in price as in most cities, but from a quick browse on Hotels.com (my favorite site for booking hotels), I found a few options for a 3 star hotel for under $150/night. Full day in Milan. If you're looking to do a self guided day, spend the morning visiting the Last Supper at Santa Maria delle Grazie, have a long lunch to gain all your energy, then do the trek up to the top of the duomo! The views are awesome, and it's absolutely worth a visit. 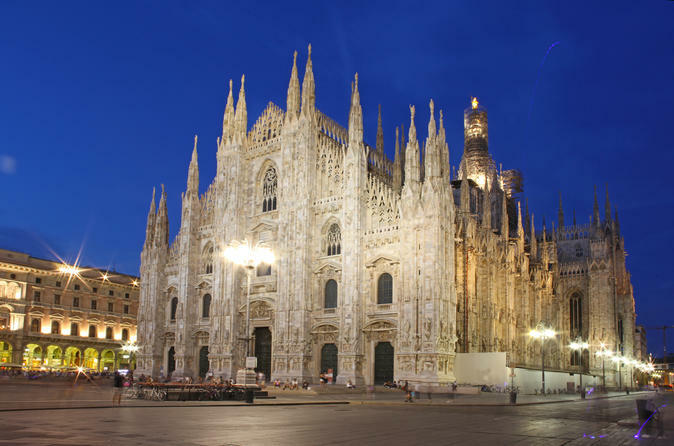 If you want to see more of Milan without the hassle of booking everything yourself, check out a guided tour of Milan. There are many that include both The Last Supper and the duomo, including this one and this one. The tours might cost a bit more than individual entry, but you'll usually get to skip the line at attractions and see things you might not have gone to on your own, plus the tour guides are typically really great! 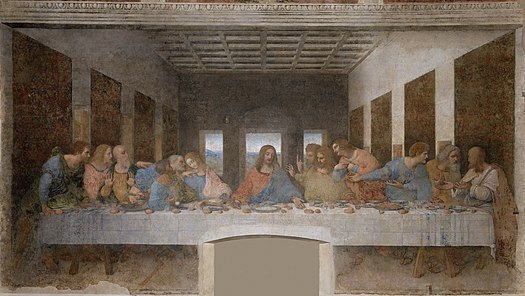 TRAVEL TIP: If you are going on a self guided tour of Milan and want to visit The Last Supper, be absolutely sure to book your tickets in advance! Tickets usually sell out, and it might be hard to get them unless you book with a tour if you don't book ahead. But, if you don't happen to book ahead, it's still worth a shot to swing by and see if they have anything available - sometimes single tickets are available. Extra day in Milan: If you have the time, I would recommend staying an extra day/night in Milan and taking a day tour to Verona and Lake Garda. It only costs about $100, and it's a great way to get outside of the big cities. The specific tour I linked to is only offered on Tuesdays and Fridays, but there are other day tours available as well! I visited both places when I studied abroad in Italy, and I really enjoyed both - Verona was a quieter town with the famous "Juliet's balcony" from Shakespeare's Romeo & Juliet, and Lake Garda was gorgeous, especially the town of Sirmione! 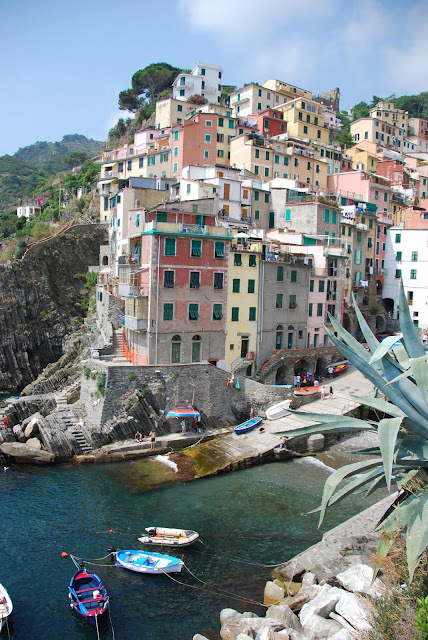 Start off early, with a train from Milan to Monterosso al Mare, the farthest north city of Cinque Terre. There are direct trains from Milano Centrale that take 3 hours and cost about €10. Cinque Terre is one of my favorite places in Italy and one of the places I'd like to spend a lot more time exploring. It's comprised of five villages along the coast, connected by trains and hiking paths, and it's a lovely spot to spend some relaxing time! Arrive mid-morning, drop your bags, and take the train to Riomaggiore, the farthest south village. Check out the little beach and cove in Riomaggiore, and then work your way back up to Monterosso al Mare, either hiking the whole thing or by jumping back on the trains if you want to save time! There are tons of blogs dedicated to additional information on Cinque Terre - I recommend reading some of the posts from Italian Fix - including the ones on a day trip, hiking between the villages, and a beginner's guide! I'm recommending that X stay in Monterosso al Mare because I think she'll appreciate that it's a bit larger than the other villages. Plus, there are tons of options for hotels, bnbs, and rentals there! Wake up in Monterosso al Mare, have a nice breakfast, then head for the train station. To get to Florence from Cinque Terre, change trains in Pisa (or you can also go through La Spezia, too). The trip takes about 2 and a half hours and costs about €18. Once in Florence, start with a walking tour of the city - you can get an amazing feel of the city in an afternoon just by wandering. 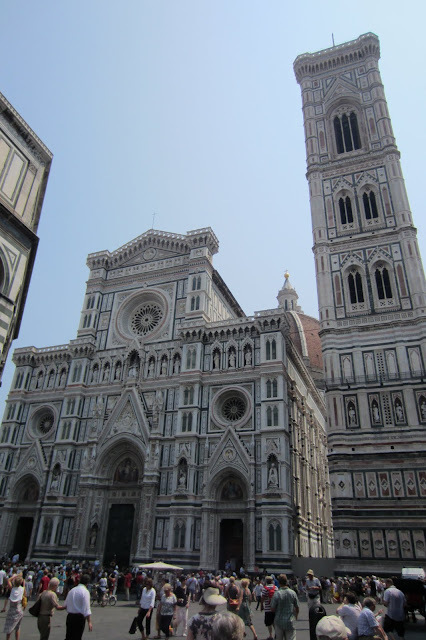 Wander from the city center and the Duomo, then continue along to Piazza della Signoria, the Palazzo Vecchio, the Uffizi gallery walk, the Arno river, and the famous Ponte Vecchio. I've written other posts about Florence - including why I love it so much, and what we did last time we were there, so check those out too! Stay in between the train station (the main station is called Santa Maria Novella) and the duomo. The areas near the San Lorenzo market usually have some really reasonably priced hotels, and they're close to many of the things you'll want to check out! A full day in Florence wouldn't be complete without a visit to the Accademia to see the David, and then there are tons of other options, too. The Uffizi is amazing for art lovers, Pitti Palace and Boboli Gardens are fun to explore, and of course, if you can make it up to Piazza Michelangelo, you'll never forget the views. Get pizza for lunch along the Arno river, and be sure to spend some time browsing in the San Lorenzo market - one of my favorite places for souvenirs and treats for yourself in Italy! It's one of the cheapest spots for souvenirs I've found, as well. Extra day in Florence: If you'd like another night in Florence, take advantage of the close proximity to smaller Tuscan cities and check out Siena and San Gimignano! San Gimignano is one of my favorite places in Italy, and Siena is unique and lovely, too. Siena is easy to get to by train (about an hour and a half ride, and €10), but San Gimignano requires a bit more effort - it's still a quick trip from Florence, but instead of the train you take a bus, and the trip requires a bus change in Poggibonsi. More on bus travel in Tuscany here! If you're not 100% comfortable with traveling on your own, check out guided tours like this one (costs about $62) that visit the cities. 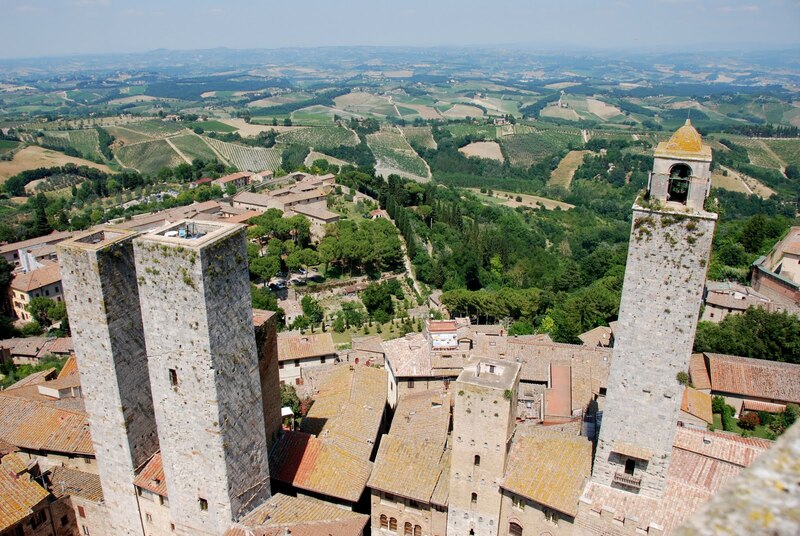 There are also chianti wine tours (costs about €90) from Florence that visit San Gimignano, if that tickles your fancy! View of Tuscany from the top of the bell tower in San Gimignano. Wake up in Florence, and either spend the morning wandering and checking out anything you think you missed or wanted to revisit (San Lorenzo market for more shopping, perhaps?). 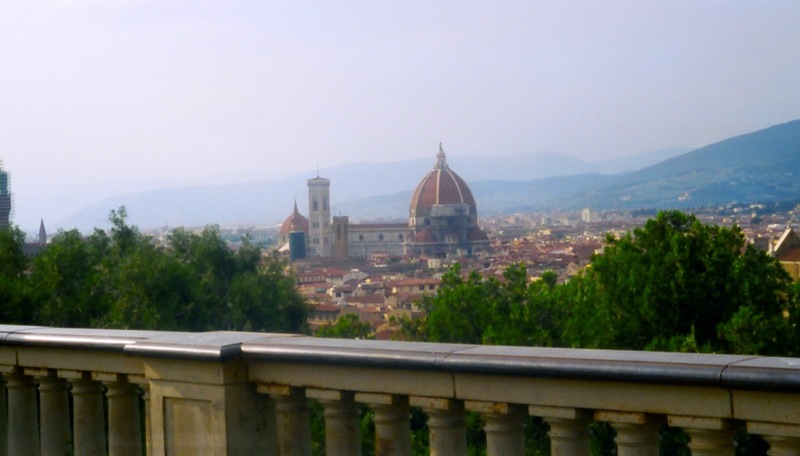 If you want to spend more time in Florence, there is also a Hop On, Hop Off bus tour. The routes go farther out around the edges of the city, so they won't take you to all the touristy locations, but do stop at some great places close to the center, like Santa Croce, the Ponte Vecchio, and the ever-recommended Piazza Michelangelo. A 24 hour ticket costs €23 as of 2016. 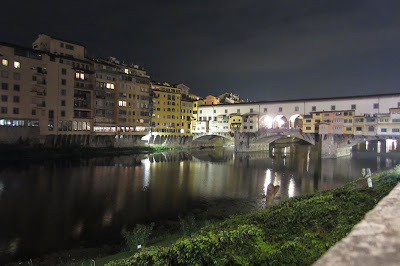 The Ponte Vecchio by night. Once you've gotten your fill of Florence (in my opinion it takes longer than two days! ), hop back on the fast train down to Rome. If you're not crunched for time and want to save a little cash, there are slower trains that take longer - the fast trains are usually around an hour and a half, while the regional trains take about 3 hours. The price isn't all that different, about €30 for the fast trains, and about €20 for the slower ones. You'll arrive back in Rome with memories of some of my favorite spots in Italy! - Italy is HOT during the summer months. The weather in Milan and Cinque Terre might be slightly less scalding, but Florence gets pretty toasty and humid! Bring lightweight clothes and drink lots of water. - You will need to book ahead for some of the tours if you choose to take them! - Trip Advisor is running a special 10% offer off of tours booked through them - the code is SUMMER10 through July, and some of the tours I linked in this post might be eligible! So, what did I miss? What parts of Italy and Tuscany are you interested in checking out? X... if you want more help with hotels and such, let me know!